Beef has been produced in Atlantic Canada since the area was first settled and continues to play a significant role in the agriculture sector. Today on Prince Edward Island, our small family farms dot the pastoral landscape where we raise cattle in the traditional way. 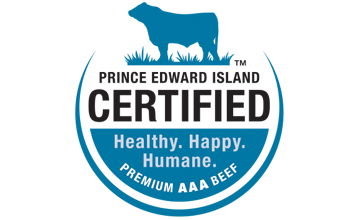 The animals well-being is our top priority, because we know that keeping cattle healthy and comfortable is essential to producing the highest quality beef. Our cattle enjoy the highest quality grass and fodder, potato and selected feeds. This healthy fare, combined with ethical farming and processing standards, produces total quality beef, rich in marbling and flavour. Our distinctive Prince Edward Island Certified Beef is among the best beef in the world.